Sagittarius signs always think they're chill, earnest, and undramatic — when secretly they feed off gossip and turmoil almost more than any other sun sign. Don't believe me? Just ask when the most dramatic divas were born. Nicki Minaj, Britney Spears, Taylor Swift, Brad Pitt, Raven Symone, Miley Cyrus, and even Jimi Hendrix were all born between Nov. 2 and Dec. 21. Plus, just think about their perfect matches — Aries, Leo, Gemini, Libra — all signs that live for excitement and honestly enable Sagittarius' need for dramatics. But OK, they do have other good qualities as well, like their love for adventure, honesty, and their great sense of humor. So as Sagittarius season sets in, we're celebrating with memes that perfectly encapsulate the perpetual Sag mood. Tag a friend, or save these on your phone so you can drag your favorite Sagittarius later. 1. We said they had good qualities, not that they were altogether great. Well, well, well. If this isn't every single Sagittarius I know. No, old roommate, I'm not talking SPECIFICALLY about you, but hey, if the shoe fits. 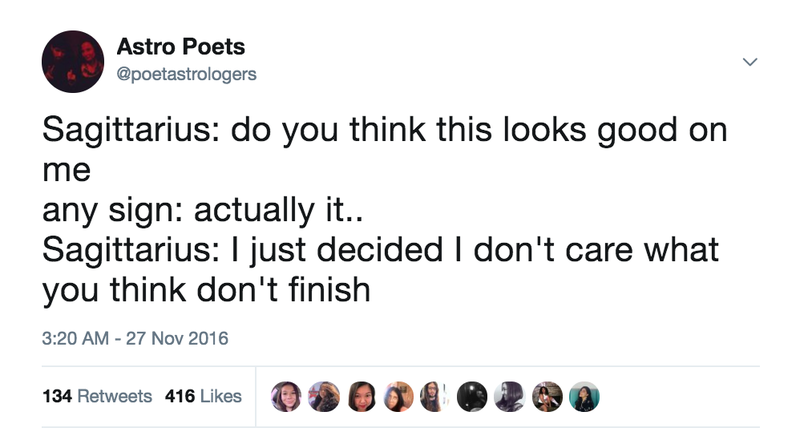 What is it with Sagittarius and their brutal (honestly painful) honesty?! And about that love of Tetris... I might need to do a quick fact-check. 2. Just a normal conversation between two loving partners, nothing to see here. On the one hand, thank you for being cute and awesome. On the other, it's like, did we even make a plan to hang tonight, bro? Oh, fun-loving Sagittariuses with their side order of shade. "Laughing in incendiary" is every Sag I've ever loved. Naturally, because I'm a Gemini. 4. Just the simple things. If you know anything about Sagittarius, it's that they're funny, painfully idealistic, and totally competitive. What sums their qualities up better than this dream? 5. These are a few of their favorite things. 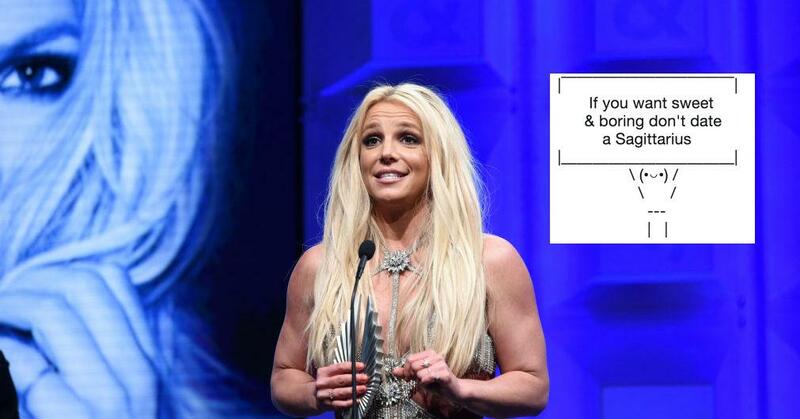 Did we mention Sags are hilarious, unrealistically ambitious and ADORE drama? No wonder I get on with them so well, TBQH. 6. When they ask for your opinion, you're better off shutting up. They're not asking for your opinion, they're asking for your approval. And honestly, they don't need your approval to continue whatever they were going to do, anyway. 7. Sags really have more crushes than there are hours in the day. Between their insane plans to woo one billion people on earth and their crazy ambitions of making history in their fields, it's no wonder that most Sag ideas end up getting scrapped before they're able to be explored. 8. No one understands the inner workings of a Sagittarius, not even themselves. 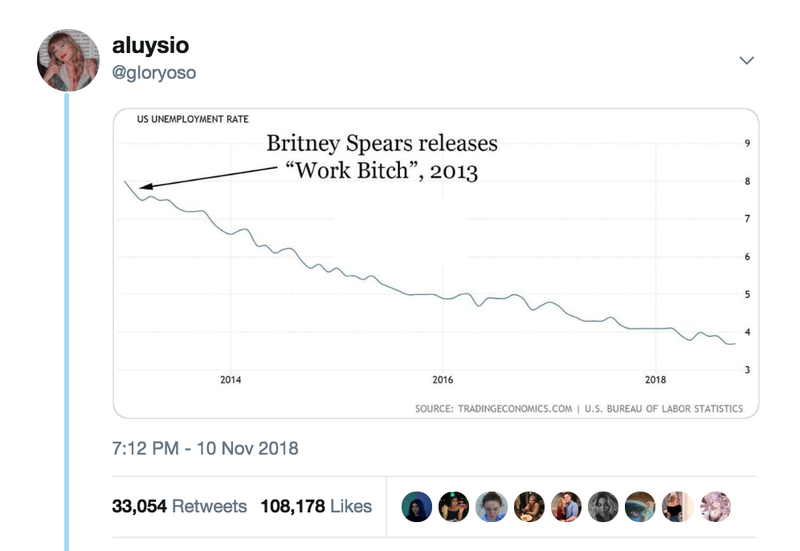 But just wow at Britney's impact on the economy as a whole. Never forget the time our favorite Sag was married for 55 hours in Las Vegas, either. Happy birthday, Sagittarius! Let's be friends forever.